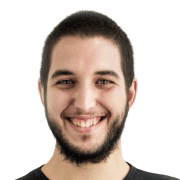 I'm MatÃ­as GarcÃ­a IsaÃ­a, and together with Brian Cardiff and MartÃ­n Verzilli, we're part of the Crystal Team working at Manas.Tech. Manas.Tech is a software company from Buenos Aires, Argentina, that develops unconventional tech projects for people around the world. And, after being involved in Crystal's development for a while, I can assure you there are not that many conventional things in developing a programming language! Crystal is a programming language that aims to be friendly for both humans and computers alike - make developers enjoy writing code, and make code run as efficiently as it can. Statically typed, compiled language with a really heavy type inference to make it feel as scripting - the best of both worlds. And did I say it's open source? Its first commit has just turned 5, and it has changed from an individual's hobby back then into an amazing language supported by Manas.Tech and an amazing community. To celebrate that, we are doing this AMA. Starting today, at 2PM EST, we'll do our best to share with you everything we know about the project, life, the universe, and everything! So - don't be shy, ask us anything! Programming language. Fast as C, slick as Ruby. How important is compilation time to the team? My biggest worry is that speeds will become unbearably slow as a project gets bigger and bigger. What are your thoughts on this. Is it possible to make things faster, maybe via incremental compilation? I love using Crystal. Thanks for all the hard work! It is very important, and one of the reasons we slowed down development. Our main concern is to get to a point where we know whether we'll have to make any breaking changes to the language to keep compilation times at a satisfactory level. That question is quite hard to answer without a formal specification of the language, but then again formal specification of the language is by itself a huge endeavor. The good news is we haven't explored the solution space, we're confident that we can make it. About incremental compilation, I'm not sure to what extent that will be possible without some "big change" to the language. Right now the "type inference magic" of Crystal depends on knowing all the source code ahead of time, and that makes it difficult to identify proper compilation units. You could look at what Rust is doing with incremental compilation. They do type inference in a similar way (though less insane) and they've been working on getting incremental compilation for a few years now. We do a look a lot at Rust, not only regarding incremental compilation. We really like how they organized the community, for example. And given they also use LLVM, we sometimes can leverage some of their findings, tooling or advances, so if there's any member of the Rust team seeing this: thank you for being a source of inspiration :). I wonder if requiring all public api (input params and return types of every public method) of a file to be typed would allow incremental compilation. In that case, you could add a switch to the compiler to warn you of any typing required to allow incremental compilation. That way, if you want to speed up compilation, you could add the required type. Is it feasible? Could you tell me more about your community, your resources for it look incredibly robust. How did it grow in the many branches it is now ( reddit, chatroom, repo, etc) and how do you manage it? Also in hindsight how would you suggest a newbie go about creating a language and growing a community around a new lang go about it? Honestly, it just sort of happened. I think we never imagined Crystal would make it this far. It started as an experiment to see what compiled Ruby would look like. The next thing we knew there were a few people crazy enough to try it and report issues. One day someone posted it to Reddit and people got interested. Step by step. From time to time someone from the community says "hey, it'd be cool to have X, would you mind if I do it?" and we're like "Yes, go for it!". Then if the thing picks up steam we link it from the official site. I think that happened with reddit, the chatroom, gitter, etc. For example, recently a group of crystallers joined forces and created github.com/crystal-lang-tools to tackle all editor support projects under the same umbrella. They let us know and we transferred our Sublime plugin. That's great because we currently have more on our plates than we can manage! Thanks for sharing the organic nature of this sounds super fun. Would you say that Crystal is beginner friendly regarding Open Source Contributions? It definitely is! We are a small yet really friendly community which is always open for everyone. Thanks Serdar, will do. 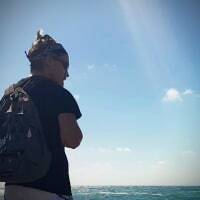 I've been looking for a friendly Open Source community to get involved with. selamlar abi , abi senin haberin var mi bunlar ne zaman windows ichin bir shey'ler yapacaklar ? ya ELIXIR teamiyle koshushtuk bize buyuk destek oldular ve baazi ishlerimizi elixir'le yaptik amma bunlara ne kadar email falan atiyorum konushuyorum hich bir shey soylemiyorlar ve belli ki 2025 ancak bunlar windows ichin bir sheyler verir ! windows 10 da kullana bilmiyoruz ve bu beni childiriyor ! benim bildighim kadar sen KEMAL'i yazansin sende luft et bunlardan bir konush sor ne zaman bunlar windows ichin bir shey yapacak ? I don't think a single person could handle all the community channels and communications. There are some of us (in the whole community) that are more skilled and eager to share, curate and prepare content. For a management perspective he have some hooks into Slack to avoid constant querying all the channels. But that is the smallest part. First we have a website, some docs people and read, then we added the mailing list as a way to users reach us and start conversating (besides from github). But then IRC emerged and @jhass created a service to cross post to Gitter. A Slack was also created, but IRC+Gitter worked better for here. I think that constant conversation & sharing in that channel is important to a community. Yet, is not always easy. Serdar and Matias do great job in the community nowadays #Kudos. An online playground and a share code service (even a basic one) is agreat resource. As with any open source project there is a challenge (and joy) in trusting people with who you will be able to delegate and even share resposibilities. Tips: Start little by little. Do something is useful for you. Be patient. Thank you Brian :) I'm just trying my best to share how awesome Crystal is with everyone! Can you discuss Crystal's approach to solving this problem and some of the advantages/pitfalls that we may encounter using it? I don't see the GC going away. It could change the which GC is used though. Regarding parallelism, currently, something that could happen is to go something more like Ruby's Guild and do runtime checks. And it would be great to have some built in constructs for some well-known patterns. Doing runtime would add some overhead to the operations. That is something to try to minimize. 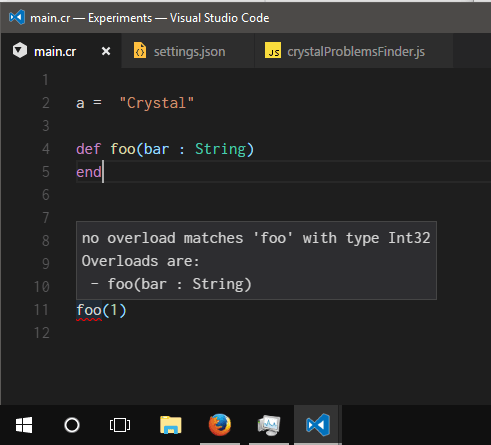 As I see it Crystal's goals is the type safety, type inference and syntax. I am not confident enough to innovate with something like rust ownership model. I still lack the rust experience I would like to compare that. I imagine adoption isn't just about the technical details and Crystal has a really slick presence. How do you approach the branding/marketing elements of the whole thing? Like, who's job is this, how often do you meet about these kinds of things, etc. Apart from Crystal, at Manas.Tech we've been working on end-to-end projects for the last ~15 years. So we have some Graphics and Interaction designers we're very proud of in the team :). They designed the logo, fonts, branding, website and, yes, they programmed the famous spinning logo from scratch ;). In the shortest steps possible, how does one go about creating a new programming language? That's at least for a compiled language. Steps 4 and 5 would be replaced with an interpreter. There are plenty of tutorials on the web on how to write you own language. What I always like to say is that a language is just a tool like "ls", "cat", or any application you develop: you take some input, analyze it and produce some output. Wow, one of the best answers I've ever heard about creating a programming language :) Thanks Ary! Did the name of the language come from "gee, what's a gemstone that starts with the letter C?" It was more "gee, what's a gemstone that would make for a good file extension?" cr sounded kind of nice and... we don't like to bike shed on this sorts of things too much :P, so it ended up being Crystal. Haha nice! Totally a fan of good file extensions. Has crystal approached any larger companies for support / backing ? Yes, Manas.Tech, as host of Crystal, is approaching a few companies that are interested in seeing a 1.0 release for support. It's part of our plan to speed up that timeline. Feel free to share the word if you know of any other one that could be interested in supporting! What was the biggest obstacle you had to overcome when creating Crystal? When creating a new language you have tons of things to think about. Knowing and being able to focusing on the right ones is the hardest I would say. A language is easier to toy around at the beginner and when the time goes by the decisions are sometimes harder because consensus is somewhat needed, compatibility is expected, etc. Brian will post a technical perspective on this, but I wanted to offer a non-technical one. My perception of the team's biggest stumbling situations had to do with our own natural self-criticism. The classic mentality when tackling these sort of problems is "if this could be done, someone would have already done it". The easiest way to disarm those fears is to approach the problem with a humble but curious frame and to just follow the path to see where it leads. As someone who just knows Ruby, how would you recommend learning Crystal? Is there some knowledge of C that would help a lot in order to learn Crystal? Rather than some knowledge of C the biggest initial gap would be to work with value types (stored in stack), using some mandatory type annotations and working with generics for containers like Arrays, Hashes, etc. Any experience in a statically typed language could be useful: C, C#, Java. But if you just want to have an experience learning Crystal itself it could help to fill the gaps in some areas to allow others with similar backgrounds. How do you determine how closely to align with Ruby? In the beginning, there was some idea to be Ruby-compatible. But, as always - you start developing your idea, and things change. We found there were concepts/patterns that didn't fit that well because of the differences between the languages (type system, mainly), and we found opportunities to do things in a way that we liked better than Ruby - so we did it. I personally love Ary's talk at Øredev 2016 - I didn't even know some of those programming languages that actually are an influence in Crystal! Ruby's influence is the easiest to see, because of the syntax, but you can see Go's concurrency model, Swift's non-nilable types, you-name-it. what is the current view on the timeline? what is the state of parallellization? how is the Windows port going, what are the problems? This is not to be critical, we want Crystal to succeed. We have spent some time putting together an estimate for what’s pending for a 1.0 release that we could be proud of, an it comes to about 1.400 additional hours. At a pace of 2x the monthly hours we are currently covering with donations (~54hs) that means another extra 14 months which is way longer than what we want. We are trying to rally some other sponsors to shorten that time; it's looking positive for now, but we need a few more weeks to provide another update on that. Parallelization is one of the main efforts for 1.0. We managed to run the multi-threading sieve of Eratosthenes sample with reasonable results on Linux and poor results in OS X. Windows port is advancing thanks to the extended community, can't comment much else on that. I wouldn't want Windows support to block 1.0! I think it would be important to get feature complete with 1.0, which, in turn, will expand the interest and base for Windows support. Agreed. It's not blocking 1.0. I want Windows support, but I agree with Doug. I think after 1.0, more people will join to Crystal community and do Windows port easier. What are the most practical applications of crystal at the moment? We're a Ruby/Rails shop that could probably jump in and be comfortable using it quickly, but I don't immediately have a practical use case in mind. What's a good place to start making it a worthwhile environment to jump in to? I've been using Crystal for microservices/REST APIs in the last two months. It actually fits pretty well with those kinds of applications. The code ended up smaller and more well structured than the Node.js version, and it actually runs 2x-5x faster, depending on the endpoint complexity. AFAIK there are also some folks working on more complex stuff such as machine-learning and game engines using Crystal, so its probably a good contender for those tasks too. Cool, that could definitely be interesting. P.S: I'm the author of Kemal. Kemal is awesome! Makes creating services very easy! :) Kudos good sir! Compilers and command line tools are for sure good fits. But we have also create bots (slack / twilio / telegram), some other microservices and small web apps with some UI. Comparing to Rails, there is for sure a lot things to cover. ORM and a smooth assets management would be my top 2 things that I would like to see solved / documented and avoid reinventing the wheel in order to start participating more in the web apps market. Depending on your interest crystal could be good enough for game dev, using c libs in a more friendly way, and data science. What language/s do you consider the one to beat? What language do you consider the most similar to Crystal? Do you consider the current GC algorithm good enough for v.1.0 ? Do you consider web dev as the bigger use case or do you have other scenarios like native app-dev, games, IoT, etc as main use cases? I don't think we want to beat other languages. We actually use other languages and love them all, like Ruby, Elixir and Go. With Crystal we try to provide an alternative that's fun to work with and performant when possible, but that of course depends on everyone's preferences (some like Ruby's syntax, others don't). We actually encourage others to combine Crystal with other languages. It's hard to find other languages that are similar to Crystal. I'd say the syntax is very close to Ruby, the runtime maybe a mix of Ruby and Go (but just a bit), and since we have value types we are maybe similar to C#, D and Swift. And we have multiple dispatch, which Julia also has, so there's a similarity too. We use LLVM as a backend, which Rust and Julia do too. As you can see, we get inspiration from many, many languages. I think the GC algorithm might be good enough for v1.0. Versions past 1.0 will be all about improving the performance and fixing potential bugs, while retaining backwards compatibility. For example Go improves their GC each time in every version, so maybe the one in 1.0 wasn't that good (if you compare it to the current one ;-)). I'd personally love to see Crystal being used in other contexts than web apps. For example I'm a big fan of videogames, I play them every day, and I'm super happy when I see others creating games in Crystal (BlaXpirit is probably the one leading this effort). Manas.Tech is full of language geeks, and as such we don't like to frame Crystal's growth in terms of beating X language. We prefer to take inspiration from them, and think there's room in the world for everyone. Do The Beatles beat The Rolling Stones or vice-versa? I don't want to pick, I want to listen to them both! Crystal will be appropriate in some contexts, and its syntax and philosophy might resonate better with you than other languages in those cases, then you'll use it. As far as similarities go, I see it being most comparable to Go, Ruby, Python in different aspects or contexts. The current GC is out of the box, and does a surprisingly good job for now. We might need to tweak it or write one from scratch if we stumble upon any limitations while getting to support parallelism; we still don't know. I've some high scale APIs running for more than 1 year without any restarts and there's no memory leak at all. I can easily say that the current GC (Boehm GC) is pretty good enough. How many people are working on crystal? How much time do they spend? What are in your opinion currently the biggest problems with crystal? How can others support the project? What are the next three big obstacles you want to tackle / goals to achieve? In the Manas.Tech team there are around 5 or 6 devs pretty involved, but their dedication fluctuates. We try to spend at least 2 or 3 times the amount of hours funded by through Bountysource, but some months we accumulate budget in order to have longer sprints. On top of that there are 3 other core team members outside Manas.Tech that spend time depending on their personal circumstances. The same goes for the larger community. The main non-technical challenge right now is finding a sustainable way to fund (at least partially) the effort to complete 1.0. You can help by spreading the word and/or chipping in. The main technical goals for 1.0 are multi-threading, better debugging tools, modules and generics. How many people are there in the core team? What does the core team think about the biggest hurdles before 1.0? What's the relationship between Crystal and Manas.Tech? Manas.Tech is the company where Crystal was born and one of the main contributors. We are leading the core team and trying to build a community and supporter network strong enough to carry this effort forward. Proud and with a sense of healthy responsibility :-). We've had conversations with a number of those companies and the positive feedback is super helpful at this stage. In general, knowing that what we are building is solving a real need is always nice. In the PullRequests for the repo, there's a lot of PRs that have passed the travis build, and been reviewed and accepted. Is there anyone that goes through all of these PRs to either merge them, or reject them? Someone to do housekeeping on the PRs? We try and review&merge the PRs whenever we can, but we have to decide between investing our energies on that versus developing other features or tasks for the project. We love having all those PRs and community engagement, but it's our responsibility to prevent lots of little steps in the form of PRs from diverting the path we want the project to pursue. So there are PRs hanging there because we didn't find time to merge them, but also because we want to have a more general view of the underlaying issues, and come up with a global solution to that - instead of adding a bunch of patches for special cases. There's a great talk called Hammock Driven Development, by Clojure's Rich Hickey that explains this concept way better than me. Ok, that makes sense. I'll keep an eye out for any of those. Maybe that will help clean up some PRs. There's things I'd like to contribute to the language, but some are some serious undertaking. What's the best way to know what features are more likely to be merged without having to spend weeks implementing something that could potentially just be rejected? The best you can do is propose the feature or enhancement and allow some time for discussions and points of view to mature. Then we have an "status:accepted" label that we use to signal that if you tackle this as it's been discussed, we'll merge it. Ah, ok. That makes sense. So make an issue with a proposed feature, wait for it to be accepted, then tackle a PR. I think this would be a great flow for everyone to follow. Thanks! If it's a reported bug/enhancement, I would say to first discuss in the issue how it could be solved. It might seems like an extra work other than coding, but is a way to avoid doing all the coding work that might not be merged. We do value the efforts off everybody but sometimes is more that just writing code what is needed. Making decisions sometimes requires other kind of mindset, attention and time. Do you plan to organize a CrystalConf with the release of 1.0 or before? Crystal Conf would be super exciting and I would try very hard to be there. What is the team's vision for parallelism in Crystal? Do you intend actors to be fully parallelized? I will die of waiting. Please release the version of Windows. I hope you don't literally die because of this - that's not any of the language goals, for sure. Windows support is definitely on the list of Things We Want To Do™, but it's not there yet. As we always repeat - instead of dying, you can try getting yourself involved in the efforts (there's been a couple of trials at this, you can ask on the forum for guidance if needed), and/or help the fundraising so the team can devote more time to develop Crystal itself and, at some point in time, Windows support specifically. Why blog page shows wrong date? Cause we haven't fixed that bug! It's a statically-built site, but we don't rebuild it daily - so that post is from the day before the last build. Just a bug we have to fix. Any of the crystal framework usable in windows? Currently, you can use Windows Subsystem Linux and VSCode. 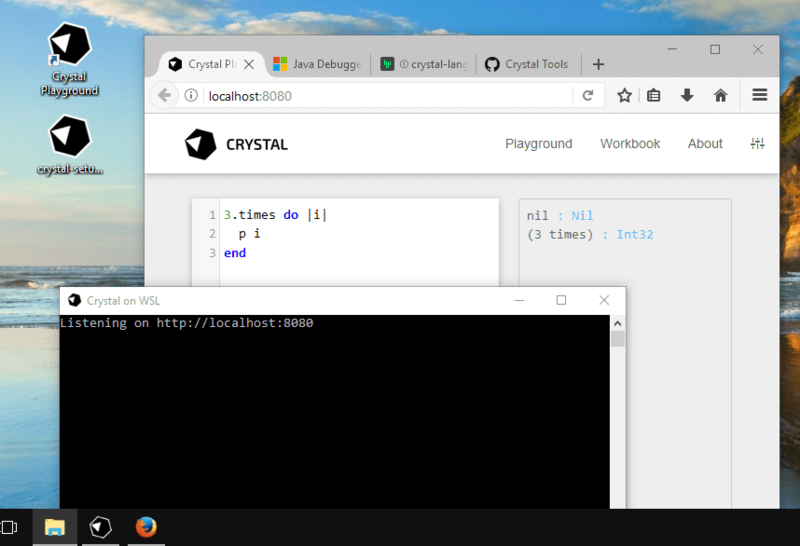 The closest kind-of-stable approach to Crystal on Windows is using the Linux Subsystem that comes with Windows 10. At least the Crystal Playground is really usable from there, even if it hardly counts as "native". Well, I think Crystal is useful for people that want a static/compiled language with the syntax feeling of a dynamic/interpreted one. I really find Crystal syntax 1000 times better than go or rust. I would start to work with it if it was widely adopted as go is. Or, actually, to see if we could! Really - Crystal was Ary's hobby project at the time. He might (or might not) explain better his motivations at the time, but it was just something fun to do. At some point, we saw the project had potential - after having used that many programming languages, we could finally create our own one, with the things we liked about others, and without the things we didn't. Or up to a certain level, at least. Fast-forward some time & efforts, we Manas.Tech as a company saw this could really work - and that it would really improve our day-to-day job if we could develop products to our clients using a language that makes us as happy as we want Crystal to do. Are there any plans (or hesitations) about extending into areas other than backend servers where binary efficiency and ease of expressiveness matters? For example, embedded or IoT? I also think Crystal would be very useful at IoT level. You can also use an empty prelude and implement your own standard library , write inline assembly executing low level code and binding C code. Some benefits are faster compilation times and smaller binaries. If you use a empty prelude the only disadvantage is no access to the standard library, but you still can use C bindings. I think we're still trying to learn all the different use cases in which Crystal may be an awesome match, but I'm not that sure that's something you can plan - I feel it's a bit ecosystem-driven. One awesome use case for Crystal that isn't that explored yet is all the command line tools made in Ruby (I'm thinking about fastlane, CocoaPods, Vagrant, Chef, you-name-it) that don't have to do with Ruby code. There's a great boost in performance if you run a command and you don't have to load the whole interpreter + parse + interpret live for a shortly-lived process - that, if you run it again, will go through the same overhead once again. IoT and embedded systems are things we have on radar, but we still haven't found how that will play with the fact of being a GCed language, for example. But you can toy with it as Faustino here says, and let us know how the language could fit your use cases better! What are some typical use cases of crystal lang? Is an obsidian icosagon the official logo/stone for crystal. Will this ever change? There was a time in which we had a different crystal on each release. Then we realised we needed to build "a brand", and settled on the current icosahedron. I won't say "we're never going to change it" - but it's not on our plans for now. Anything you don't like about Crystal? We try to build the language we like to use, but of course there are always things that can be improved. I kind of suffered when we made it mandatory to declare an instance variable's type instead of allowing it to be inferred, but it was a really well thought decision, and I think it's the correct one - even if it hurts a bit on programmer's happiness. the lack of variance in generics. that / should always be float division (instead of depending on the receiver/argument types). that the grammar type can't be blend with the language grammar. From the ecosystem, there are some stories to be improved in dependency management and development tools.